In a move initiated by Council of Southern Africa Football Associations (COSAFA) president Philip Chiyangwa, the 14-member body, African football’s biggest regional bloc, has unanimously voted to back Infantino’s candidacy. Chiyangwa, quoted by local media, said it was imperative that his region supported Infantino and give him another mandate to complete development work in the region. 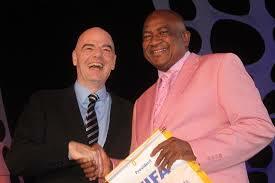 “For the period that Infantino has been in power he has not only spearheaded development of the game, he has also brought about unity,” said Chiyangwa. “There is much more money that is coming from FIFA into the coffers of the organisations like COSAFA and direct into the associations for growth and development and we have witnessed a lot of that during his time. Being endorsed by Chiyangwa, a key ally of Infantino, hardly represents a vote of confidence given that he was recently ousted as president of the Zimbabwean FA (Zifa) and upset by Elton Kamambo who inherits an association ridden with debt and internal strife. While Chiyangwa talks of more money from FIFA, ZIFA will likely be asking where it has gone. Shortly before the elections, Zimbabwe’s Anti-Corruption Commission was asked to investigate claims of “corruption, fraud, misappropriation, abuse of power, misconduct and lack of good corporate governance” during Chiyangwa’s tenure as head of the national federation. He is also accused of using dirty tricks to win the elections that ushered him into office in December 2015. Chiyangwa was a key figure in the election campaign that brought Confederation of African Football president Ahmad Ahmad to power last year. Unconfirmed reports said that in the build-up to Ahmad’s stunning victory over Issa Hayatou, Infantino personally attended a party hosted by Chiyangwa who boasted of his closeness to overthrown Zimbabwe president Robert Mugabe. Infantino, who reportedly at one time described Zimbabwe’s Chiyangwa as “my friend and brother”, has denied any complicity whatsoever in the CAF ballot that swept Ahmad into power.